It’s been a little over a year since I poked around the Dreamy Draw Dam and wrote my first article for ThePhoenixEnigma.com. Although not much to look at this little draw which connects downtown Phoenix with north Phoenix where I grew up and holds a special place in my heart. 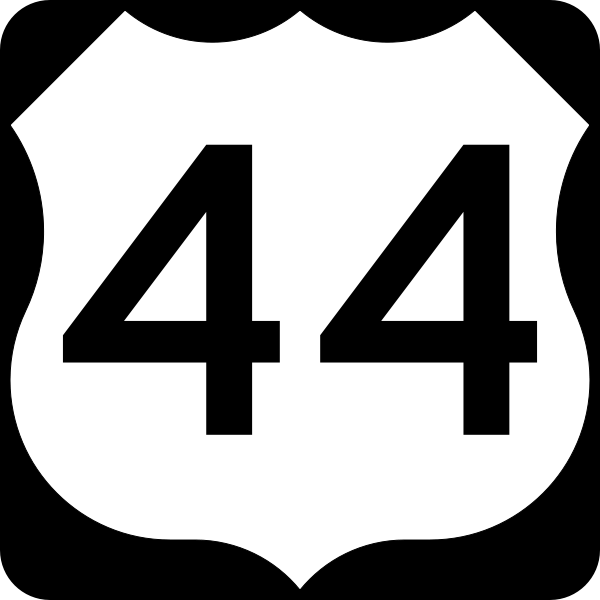 For most people this mile-long section of “the 51” or the Squaw Peak Parkway is nothing more than a bottleneck of inner city mountain preserve on their way to work in the morning, but for some locals, especially those old enough to remember Phoenix before the boom, this draw was a gateway to north Phoenix. As a child, my friends and I would ride our bikes over the North Mountain preserves and through this draw on our way to Squaw Peak. We would ride right through the draw before continuing to the foothills where we would hide them in the washes under cover of branches. From there we would continue our expeditions on foot making our way through the preserves to camp out in the valleys between the peaks. Today this is called urban camping and there is a whole subculture of people who practice it worldwide but as kids, it was the closest thing to a Goonies adventure we could muster. Since first posting an article about this little known local enigma my mind has wandered back to it regularly ever since. So today I decided to stop by the Dam to reexamine my initial thoughts concerning the less than obvious need for its very existence. I can’t put my finger on it but there is something about this dam which just doesn’t click. Nothing dark or nefarious, just something off. Like an uninvited person at a private party, it just stands out. It’s not that this dam is a huge structure and it’s not that it contains any esoteric symbols or ominous overtones. It’s not controversial or even a place many Phoneticians are aware of. Quite the contrary, this little dam which has never held back any water sits next to and BELOW the 51 freeway. 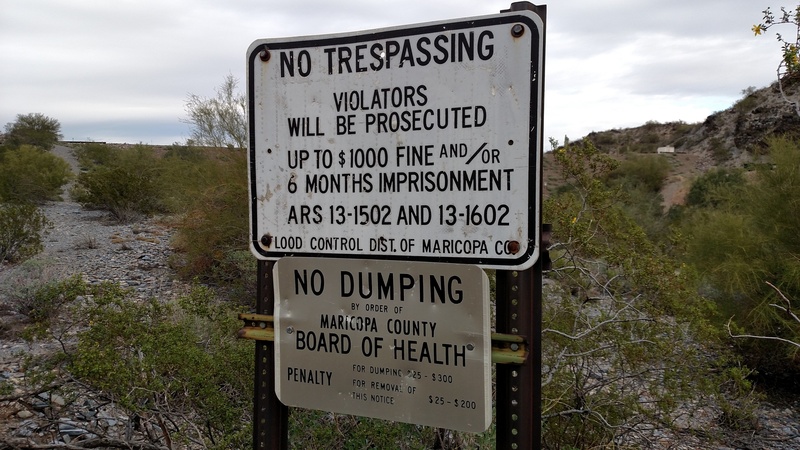 Its eastern side fenced and locked off with stern signs threatening prosecution and jail time, while its western side appears to allow permitted access and is currently being used as a transfer station for trash, however it is still fenced off with threatening signs. Though a guard tower complete with Constantine wire site atop the structure, there are no guards here; but one can, as we did, climb the small knoll just south of the installation and get a great view of the entire project and surrounding area. One of a dozen signs surrounding the Dam. So today, as my friend and I pulled off the 51 freeway and into the trailhead parking area where I relayed to her the history of Dreamy Draw. A history which includes an old cinnabar mine where miners extracted mercury, two con men who capitalized on greenhorn investors and the story of a UFO crash which supposedly took place here. 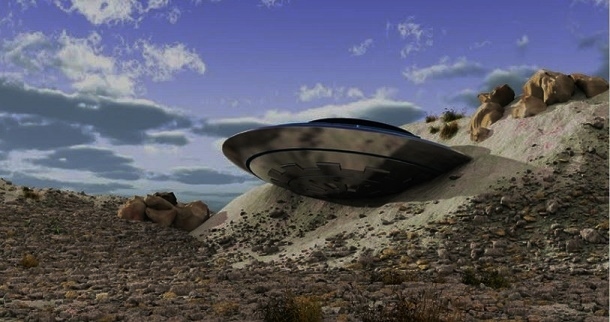 Not that it’s much of a UFO story but perhaps one of the most unsubstantiated and fabricated mesh of hearsay ever strung together which I have personally come across. For the record, I don’t believe any UFO ever graced this little draw with its shiny saucer-like presence. Rich history indeed for a glorified mountain pass separating north and central Phoenix. What snags my attention about this little draw instead is the dam itself. A dam which embodies enough of a mystery all on its own without the need for a fictionalized UFO story. If one stands atop the knoll and overlooks the project site it becomes immediately obvious that the Dreamy Draw Dam is an unnecessary structure. Even with our monsoon rains generating flash runoff from the Squaw Peak mountains to the south there is natural drainage which moves this runoff safety to the canals below. Still, the dam is here, well maintained and enjoys Federal protection. Not enough water is generated from the mountains to warrant it. As a boy, I would hike and ride my bike through these mountains weekly. The monsoon rains would eventually come and we would be up on the cliffs and crags of the Squaw Peak mountains hiking, climbing, exploring, etc. Though the washes would run sometimes, the terrain has never generated enough water to “flood” the neighborhoods below. Looking up the wash and the source of all the supposed water the dam was meant to hold back. If the dam was built to hold back water during times of seasonal monsoon flooding who the heck decided to build a road, parking facility, trailhead, plumbed restrooms and water facilities, and ranger station directly on the uphill side of it? If these mountains were to ever generate enough water to create flood conditions, WHICH THEY NEVER HAVE, these facilities and structures would most assuredly be under 30 feet of water if the dam were to do its job and hold back the runoff. How does this make any sense? How did this get approved by the city engineering dept? Who allowed this to happen and why hasn’t it been rectified? Simply because there has never been a need to rectify it. There has never been enough water held back to cause these facilities to become flooded. 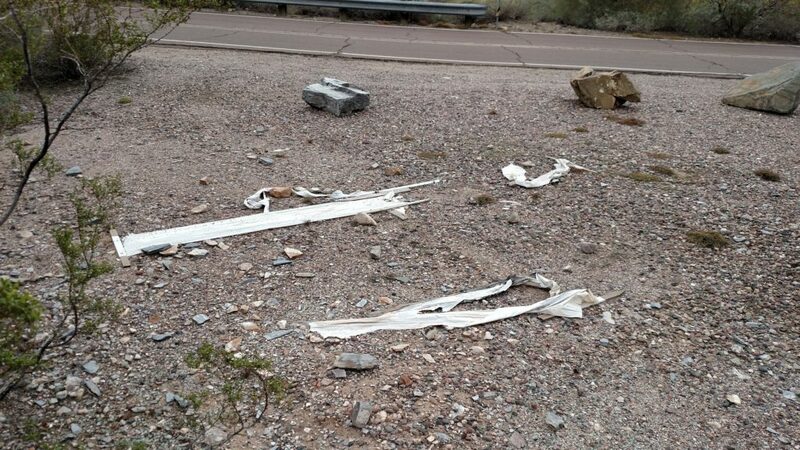 Speaking from experience as someone who has dealt with planning and zoning departments half my life, you nor I would ever be permitted to build a house or any type of structure or facility where the city of Phoenix has placed the Dreamy Draw trailhead facility. Road, Parking area, Restrooms, and Ranger Station (out of frame) which would be 10-20 feet under water if this dam did it job.If this is a site of such sensitive civil infrastructure, one which requires signs threatening $1,000 fines and jail time posted every 40 feet along a barbed wire fence, why is the western gate left open for trash removal vehicle access and the entire area used as a trash transfer station? Why is there a concrete guard shack on top of the dam complete with razor wire and what looks like communication aerials protruding from the roof if no one is ever stationed in it? True, there is what appears to be a maintained access road which stems off the 51 freeway and runs along the top of the dam to the guard shack, but the guard shack appears dilapidated. Is this just for show? Was there enough of a threat at one time to warrant a hardened guard shack? If this dam were to crumble apart or be vandalized to the point of ineffectiveness what would be the consequences? It’s not doing anything, to begin with. 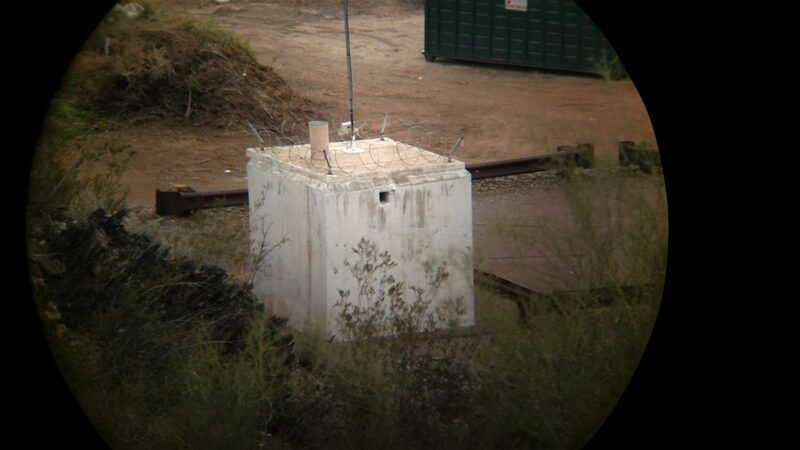 Does the city of Phoenix pay someone to stand guard in this shack regularly? I don’t know. Looks more like a hardened bunker for repelling an attack than a “Guard Shack” as described in the Army Corp of Engineers report. Why are there NO DAMS at the bases of ANY other mountains in all of Phoenix or surrounding areas? The only dams I’m aware of are the ones used in the management of our rivers and canal systems. Are the Squaw Peak mountains unique in their ability to accumulate mass volumes of monsoon runoff? Is it the lack of development at the base of these other mountains? 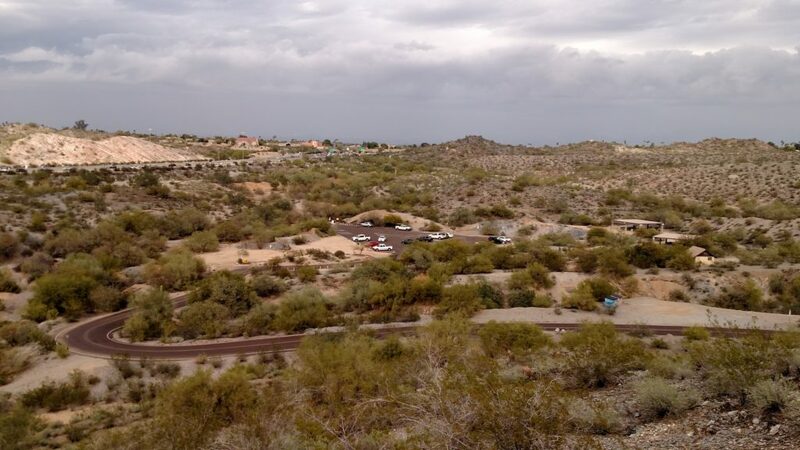 Because most mountains in the Phoenix area have high-end housing surrounding them. The two-sided Dreamy Draw Dam sign. More on this later. The back side of the main sign. Unreadable unless exiting the fenced site. As I see it, there is no good reason as to why a dam was built in the lower end of Dreamy Draw in 1973 and a quick visit and glance by any trained engineer will probably come to the same conclusion. Still, it is here and to this day we are left guessing as to why. Here are the prevailing theories as to why this dam exists. Obviously, flood control. Though there is a small pile of debris on the uphill side of the dam surrounding the intake structure showing past water accumulation, the high water debris mark is only a couple feet. Washes do run, and logs and debris do get carried downwash. Had this dam not have been built, the existing natural wash which the dam is constructed would have carried this material downwash. Still, as laid out above, there has never been levels of precipitation sufficient to cause this dam to hold back any significant amount of water. Water Intake Structure. Note the minimal amount of debris surrounding the structure and cleanliness of the upper portion of the unit. No water has ever regularly overtaken this structure. The cheap computer-generated stock photo I downloaded off the net. Ha…. The project was a scam. Now this makes sense, and as simple as it is, it never even occurred to me. It was my friend (who comes from a country rife with political and economic corruption) who right off the bat said. “I bet some politicians passed the project to skim off the top.” To say this has happened a few times throughout history would be grossly and laughingly understating it. Perhaps there were government funds available and if the district didn’t spend it they wouldn’t receive the same amount the following year. Maybe even though there wasn’t an immediate threat of flooding, there was enough concern and available funds. Perhaps it was just overly cautious planning as the eastern Sunny Slope district filled in and the 16th st and Northern Ave area began to increase in value. It is no secret that important people have a way of making things go their way. Perhaps the fear of flooding in this area alone was enough of an issue at this time that a few “movers and shakers” pushed the project through. The only problem with this theory, however, is that history would prove that these fears are unfounded yet the city still continues to fund the maintenance of the dam. Last but not least and my personal favorite -The Dam is the entrance to an underground government facility or tunnel system. With what we know about government tunnel systems today I don’t understand why this isn’t given more consideration. This theory puts forth that the construction of the Dreamy Draw Dam is strategically placed, low key, semi-public, working facility which would allow for the coming and going of government vehicles and large supply trucks IE (garbage trucks.) As you can see the Dam has easy access off the 51 freeway and Northern Ave and secondary access from the 51 freeway itself to the north. There is often a DPS SUV sitting on Northern Ave facing west, it is presumed he is policing traffic. Could this facility tunnel to another location? I’ve covered the U.S. Government’s tunnel system in another article titled D.UM.B.S. We know for a fact that these tunnels do exist and are very real. Perhaps this would also explain the reason why the Dreamy Draw Dam sign is inscribed on both sides (so people coming out of the tunnel system would know what location they emerged at.) You have to admit it’s not normal to have a sign informing you of where you have just been, especially at an industrial government project which is fenced off from the public. 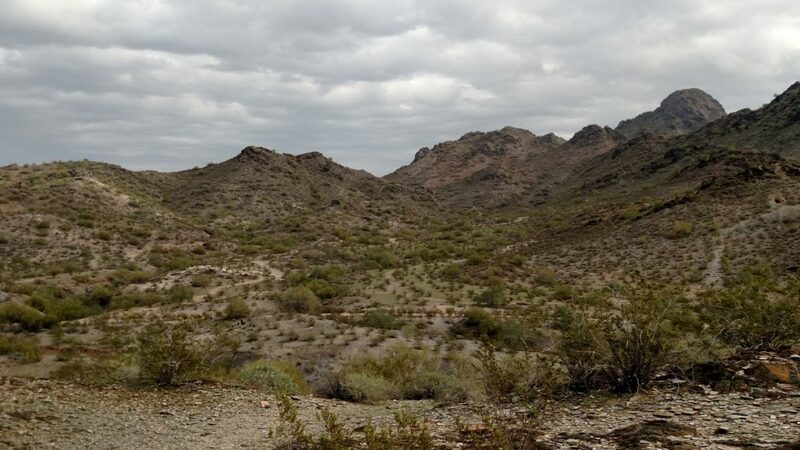 There are a number of other military and national guard bases which are built into the sides of other mountain preservers in the Phoenix area. The Arizona National Guard 855th Military Police Company is located only 2.14 miles as the crow flies to the northwest. Is it crazy to think that this government maintained and funded dam (which has never held back any water) couldn’t be an emergency entrance? What about the Arizona Army National Guard State Emergency Operation Center located just under 8 miles to the south? According to my sources, this installation goes 7 levels underground and is considered a hardened facility as it is built into the conglomerate bedrock and not the soft alluvial soil which makes up the valley floor. 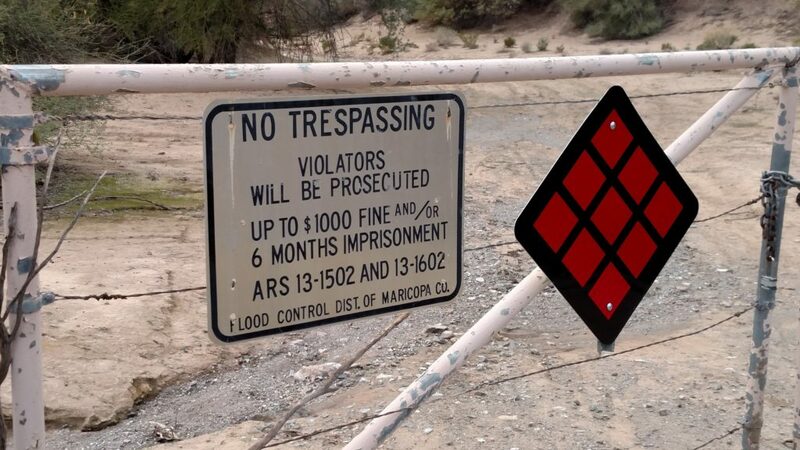 Whether this facility is meant to protect the population of Phoenix in time of emergency and crisis or control them during a federal takeover is anyone’s guess, but acknowledging their close proximity it seems not only possible but probable that these facilities would connect under Phoenix. Then there is the idea that there is a facility itself is located inside the northwest side of the Squaw Peak mountain preserve. This does seem a rather large stretch as there would surely be a massive amount of traffic through the dam. But if the dam itself was only used as an occasional entrance point and the main entrances were located at nearby military installations it seems plausible. One could only imagine the level of secrecy needed to pull off something of this magnitude. Old Ground Helicopter signals next to the main sign. Still, there are levels of investigation which are approachable. Financial, for one. I would be curious to know how much money is allocated each year to the upkeep of this dam and the flow of those funds. Then there are human resources. Is that guard shack ever manned? If so what times and how often? Regular maintenance crews. The dam itself appears to be in good shape as there are no signs of erosion gnawing at its foundation or crest, someone must surely maintain it. If it is a government facility they wouldn’t just hire Joe Blow rock and gravel to maintain it. Then there is the transfer station which removes the trash, this has to be operated by someone. View of Dam from the Knoll to the south. Note the pile of white trash bags and dumpster on left side of photo, just beyond the guard shack. I did find this PDF of a periodic inspection report from October of 1975. It not only outlines a routine inspection of the dam and the results of that inspection but who performed it, where they flew from to get here, what hotel they stayed at, cost of their rental cars, etc. 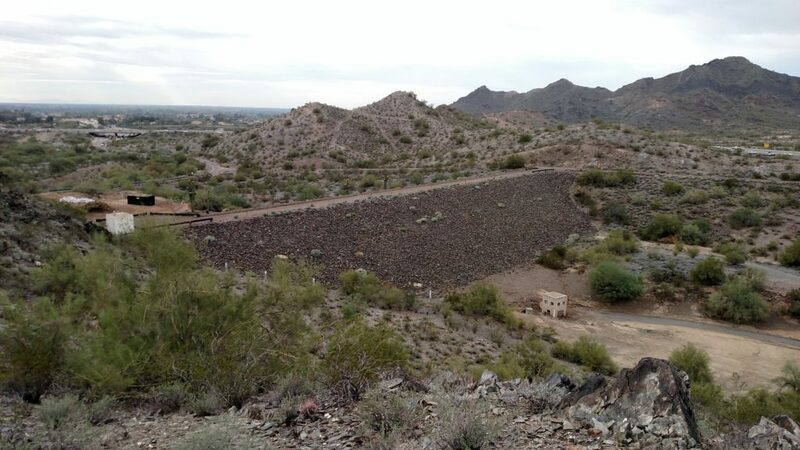 It’s apparent from the photos in the report and the language used, the dam was constructed to temporally halt the rush of water coming off the Squaw Peak Mountains and slowly discharge it on the downhill side of the dam apparently creating a manageable flow of water to be directed downwash. It outlines in detail the intake structure and spillway as well as other features of the dam. Does this prove or disprove anything? Not entirely, though it does lend heavily to the argument that the dam truly is just a flood control device. Though to go “shiny side out” for a moment it could it be this AND an entrance to tunnels or an underground facility? I don’t see why not as this would only add to the cover story. 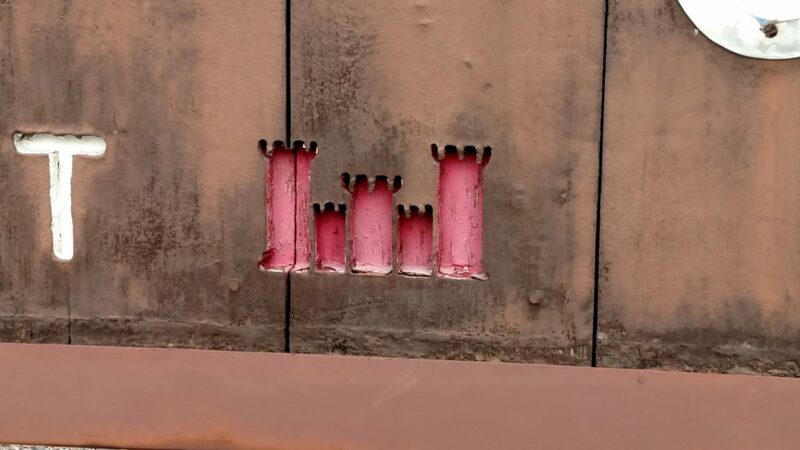 Corps Castle Logo on lower corners of the sign on both sides. So there you go. A few of my most recent thoughts on the Dreamy Draw Dam as of late. For the record, I am not advocating that anyone break the law, trespass, or vandalize this structure in any way. If it is a military facility providing access to underground facilities for the protection of the city and its residence then I suppose this article didn’t help their cause and I should apologize. However, that being said I’m sure I’ll know when I get to close to the truth. Until then, I’m confident they know where to find me. Ha. I saw this documentary called “there are no forests”. It talked about how many what we think are mountains or canyons are actually ancient quarry sites. I was looking at the “mountains” in Sunnyslope area. They look more like piles of rocks or dirt, like it was quarried. I started looking at other mountains and they seem like it was piled on rocks which grew vegetation over time. Just a thought, and if you ever came across anything like this. Yes….I’ve watched that Documentary as well. I can’t say that I agree with it at all. While the images and photography were striking, the foundational science it was based upon was in my opinion fanciful at best as it ignored any and all basic science available to us today. As a species we know how mountains were formed, we can delve into the molecular makeup of physical material and reverse engineer its components. The doc leads the viewer to believe, regardless of geologic science, that any and all rock formations which happen to look like tree stumps are in fact remnants of an ancient gigantic forest which once covered our planet. It is just bad theory in my opinion, without base….. It they had managed to back up their fluff with ANY form of science that would be a different story. I suppose I’ll just have to wait for part 2. LOL. As for the rocks/mountains in “The Valley of the Sun” they are indeed ancient. They are on average close to 2 Billion years old. That’s Billion with a “B”. The lower 1/3 of Arizona is classified geologically as “Basin and Range” and is the result of the Pacific plate ramming and then pulling away from the continental plate, 7 times. Some of the mountains in Phoenix are sedimentary, while others are volcanic on the northern side. Still others like South Mountain are a metamorphic core complex and mystify geologists to this day. I can tell you this. The geology of Phoenix, Arizona is hands down the most complex geology in the entire United States. Veteran geologists come here regularly to attempt to understand and reverse engineer it. Much of it is still a mystery. Just stumbled across this. What if that guard shack is only partially a guard shack? It might be access to the tunnels or the dam itself. That would explain both the communications equipment and the hardened look. You wouldn’t want anyone knowing you could just go in through there, plus they’d be easily seen trying to get to the shack.